*DHL shipping upgrade is available at check out process. Shipping part by DHL will take 3-6 days only. Production time may take around 2-3 weeks. 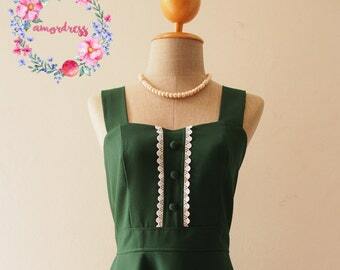 Alita dress in elegant green. A sweet feminine look party dress which featured ruffle at sleeve, sweetheart bust line with flare swing skirt shape. This is lovely one for formal work teaming with a high heel or wear to a perfect summer day out to town. This is for all, grab one and you will in love with this dress. Also custom length for this dress is available please convo. The length below is in standard size. You can request shorter or longer length. Production time is around 1-2 weeks. ✔CUSTOM SIZE (*Please contact) in case you need us to modify sizing to fit you. DHL shipping upgrade is available at check out process. All packages shipped via registered air mail with tracking number. ** Please note that package tracking is available in some countries. Normally customers can check tracking two weeks after the package is shipped. Any international duties/customs fees are the responsibility of the buyer. I adore this dress!! I ordered from this shop before and while I liked that dress, the fit around the busy area was a bit weird. I ordered the same size on this dress and it fits much better (which I think is partially the cut of the dress and partially the fabric). I would just keep that in mind when ordering a different style of dress. It took a while to get to me because they were out of the original fabric, but I LOVE this pale yellow! The stitching is all perfect and has no loose threads, not even on the neckline appliqué. It’s nice and stretchy, so I had no problem getting it over my wider parts, but it stays tight on my waistline. I also added on pockets and they’re so deep and seamless, which is a great help. Overall I would totally recommend this dress!! Not exactly as pictured the dress I received had different buttons. We do custom to size, length, fabric and minor alteration to straps design. Please contact for your request. Our outfit are true to size in description. Please no need to choose a size up. We offer EMS service, please contact for more info.